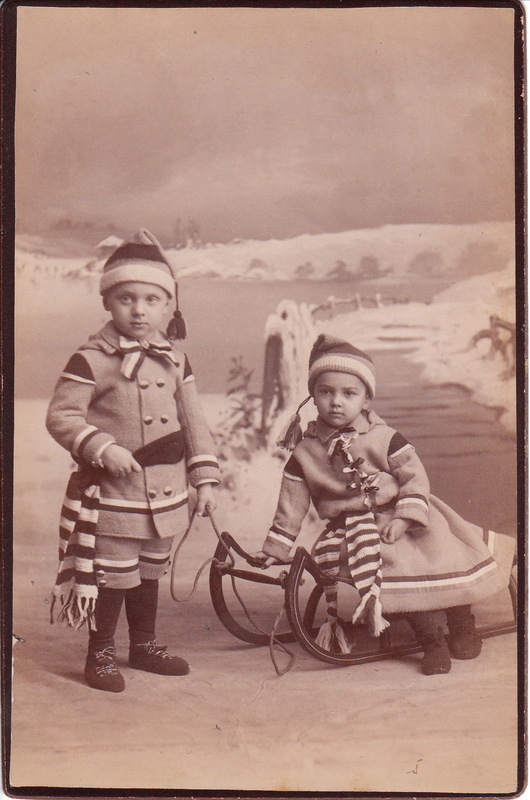 Two women dressed in winter coats pose for their portrait at Boyer Brothers studio in West Superior, Wisconsin. They appear well prepared for the winter scene that is hanging behind them. Both women are holding books in their arms. 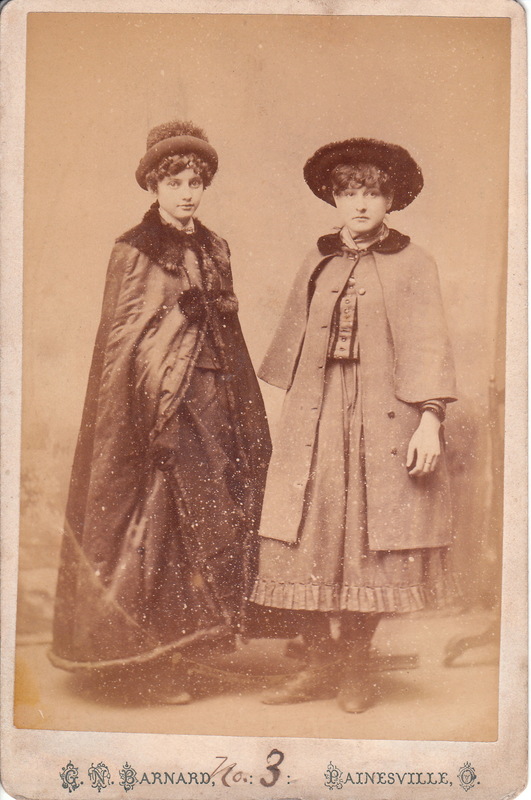 Unlike most subjects appearing in cabinet cards, these two ladies are smiling. The Boyer Brothers include Hans R. Boyer, Henry Boyer, and Robert H. Boyer. The brothers worked in various combinations and in a number of partnerships in Superior, Wisconsin and Duluth, Minnesota. They were associated with studios from the 1880s through the 1910’s. 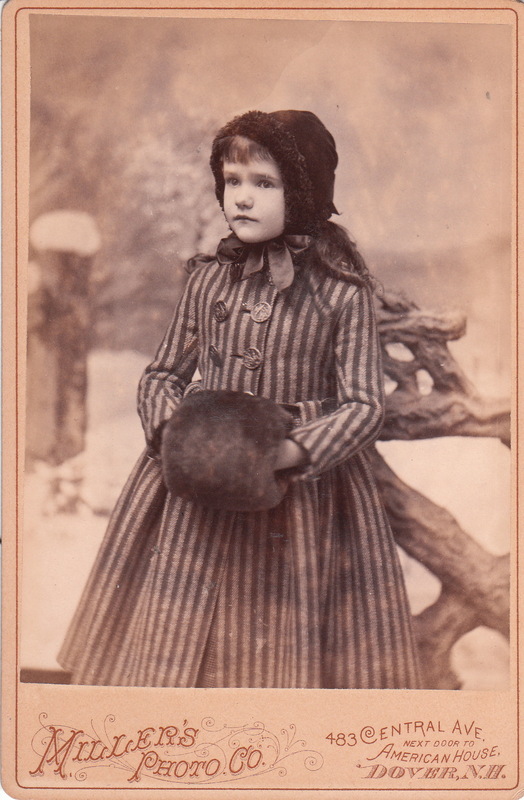 A young girl wearing a winter coat and winter hat poses for her photograph at Miller’s Photo Company in Dover, New Hampshire. She is wearing a striped coat with big buttons and has a large fur muff to warm her hands. 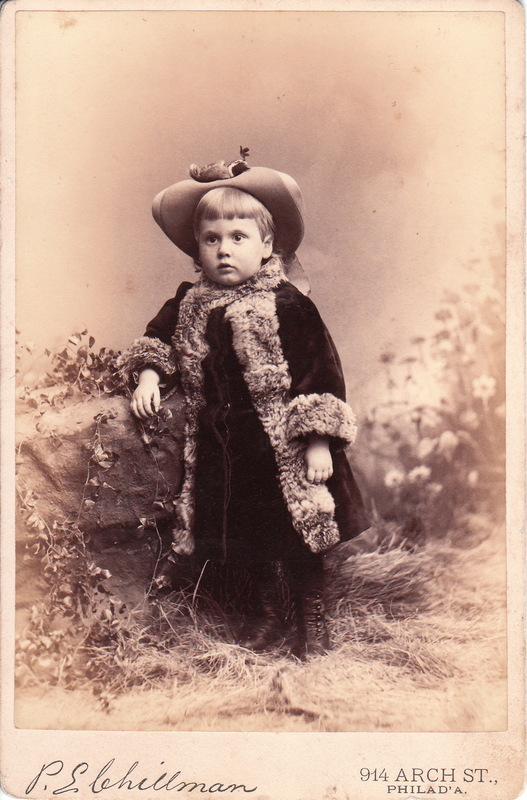 Judging by my observation of many cabinet cards, the striped coat is not typical winter wear for the era. The large stripes on the coat makes it look like prison garb. Note the fake snow in the background of this image. The reverse of the photograph has a printed advertisement that indicates that photographer Miller’s main gallery was located in Birmingham, Connecticut. 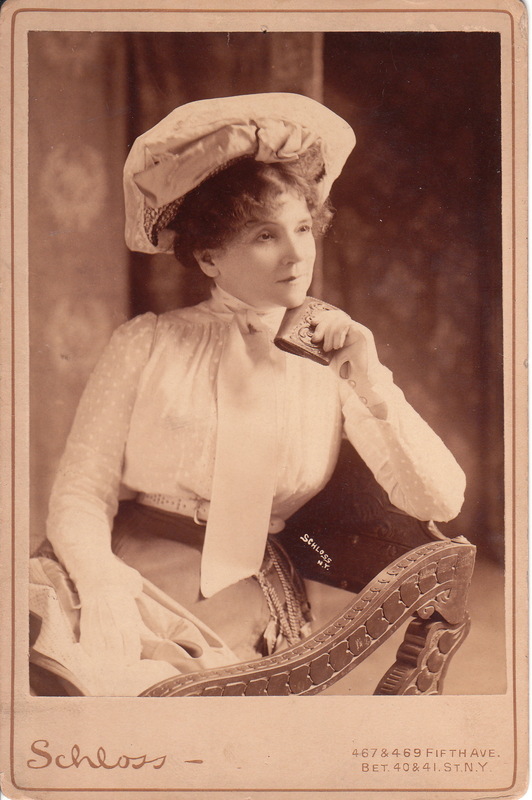 The likely photographer of this cabinet card was William E. Miller. Miller had a number of studios located in Connecticut. His gallery locations included the towns of Ansonia, Birmingham, Derby and Shelton. Miller is credited with taking some of the photographs for a book entitled The History of the Old Town of Derby, Connecticut 1642-1880 (1880). To view other images by this photographer, click on the category “Photographer: Miller”. 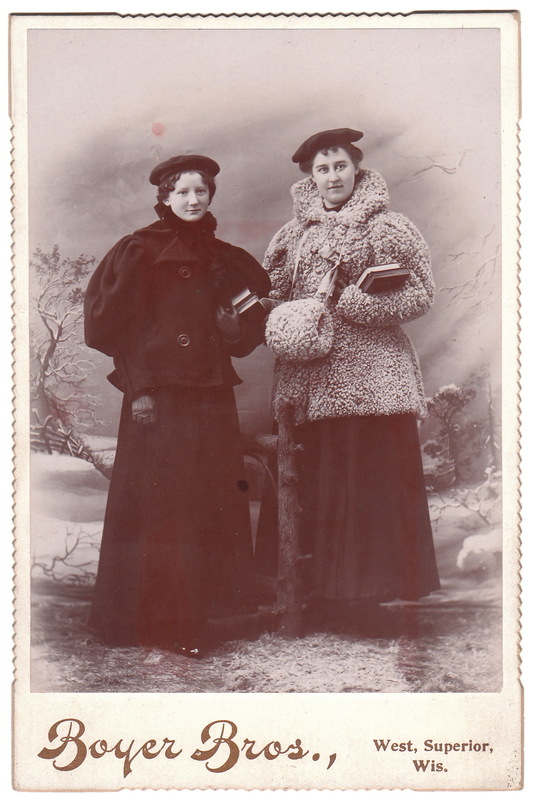 This cabinet card features two woman dressed in their winter cloaks and hats. They are in the studio of G. N. Barnard in Painesville, Ohio. The photograph has some special effects in the form of fake falling snow. The factor that makes this photograph most special, is the photographer’s life story. George N. Barnard (1819-1902), was a pioneer of nineteenth century photography. At age 23 he was producing daguerrotypes and four years later he opened his first studio in Oswego, New York. An 1853 grain elevator fire occurred in Oswego, and Barnard captured the fire with his camera. Some historians consider these photographs the first news photography in history. In 1854 he opened a short lived studio in Syracuse, New York. He then moved to New York City where he worked on stereoscopes for Edward Anthony’s Studio in 1859 .Soon, he was hired by Matthew Brady as a portrait photographer and Brady sent him to Washington D.C. to photograph Abraham Lincoln’s 1861 inauguration as President of the United States. He later became part of “Brady’s Photographic Corps” to photograph the Civil War. Barnard is best known for his work in the civil war (1861-1865). He was the official army photographer for the Military Division of the Mississippi, commanded by Union General William T Sherman. Barnard’s book “Photographic Views of Sherman’s Campaign” is a photographic record of Sherman’s destructive Atlanta Campaign and subsequent March to the Sea. After the war, Barnard opened a studio in Chicago in 1869. The studio was destroyed in the “Great Fire” of 1871. He proceeded to take photographs of the rebuilding of Chicago over the next few years; providing a terrific record of that process. 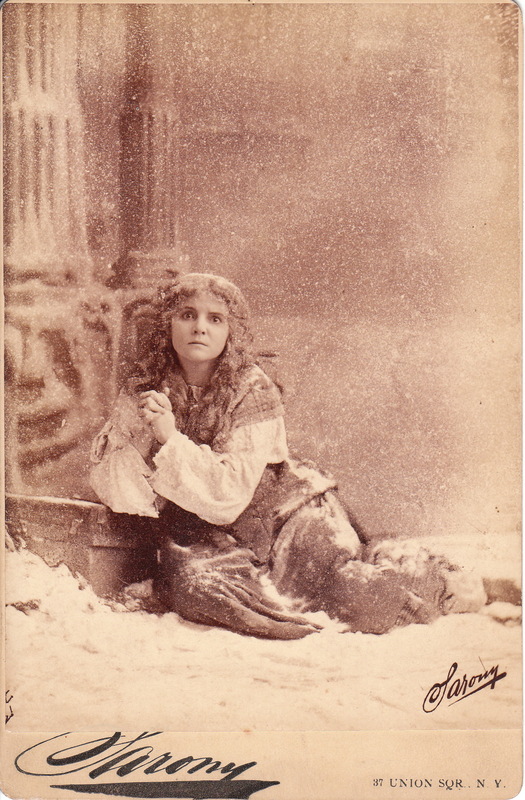 In 1884, Barnard opened his Painesville, Ohio studio; which brings us back to the cabinet card image of the two ladies in the snow. 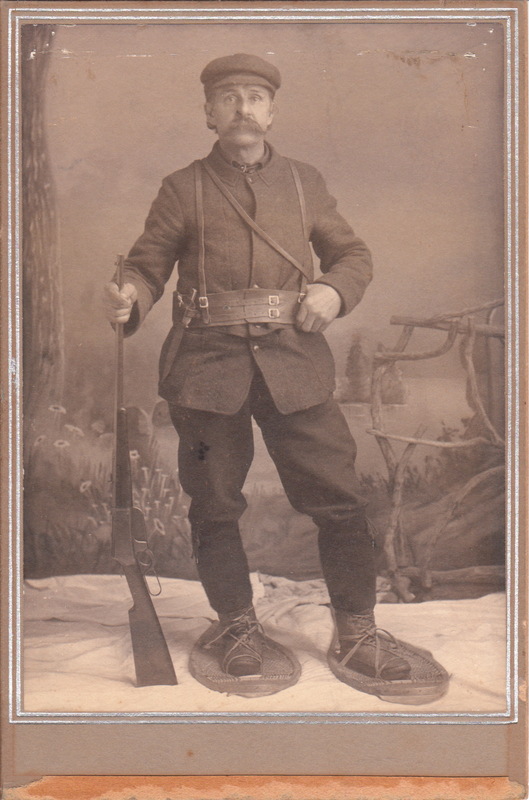 This photograph features a hunter/trapper who is well armed for his expedition. He has a rifle and is wearing a knife on his belt. 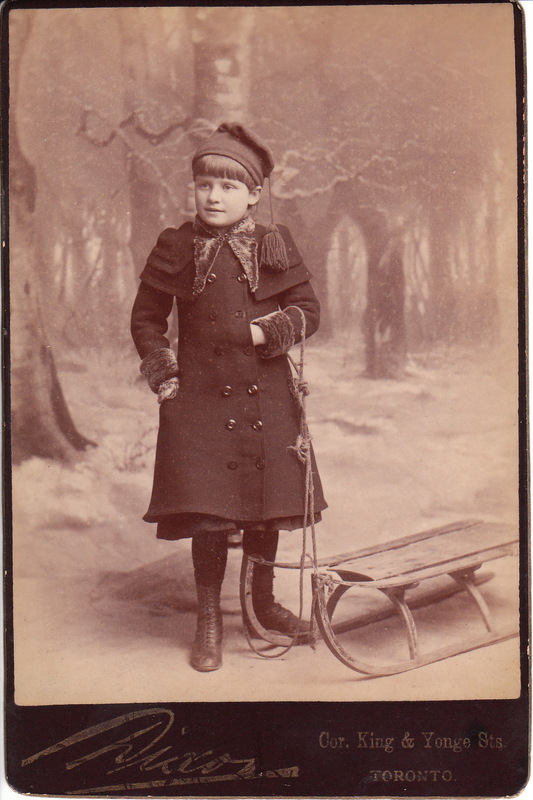 He is wearing winter gear which includes a jacket, cap, and snow shoes. This image was found in Nova Scotia, Canada. It is likely that the pictured outdoorsman is French, and that the studio was located in Nova Scotia.